The Xamarin.Forms Navigation Drawer (AKA sidebar) control provides a sliding panel to display menus vertically at the left or right side of the view. Supports transition, secondary drawer, and more. The Xamarin.Forms Navigation Drawer control is a sliding panel that can be used to hide content like menus from the visible area of the screen. The control allows you to host any view inside the sliding panel. Position the drawer at the left, right, top, or bottom. Slide the drawer in with various transition effects such as push, reveal, or a slide-on-top effect. 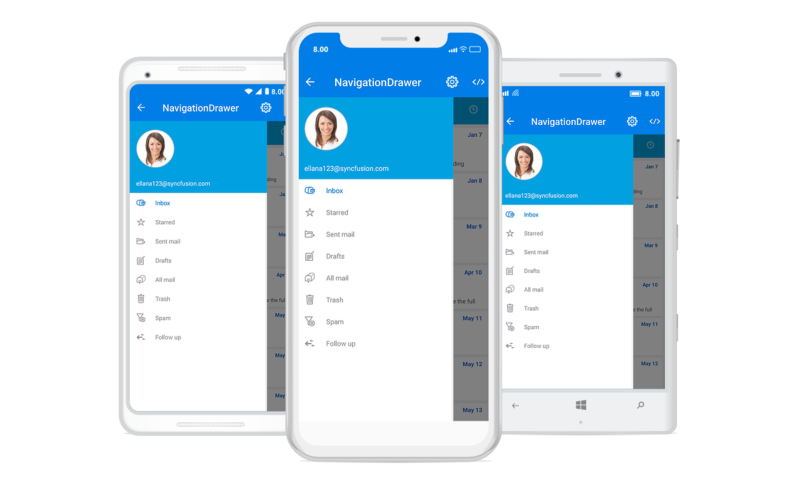 Add a header view at the top of the Xamarin.Forms Navigation Drawer to display information like a title, picture, and description of the application. Add a footer view at the bottom of the Xamarin.Forms Navigation Drawer to display some action like logout or exit. The Xamarin.Forms Navigation Drawer allows you to have a secondary drawer and position it at the left, right, top, or bottom position, like the primary drawer. Users can access different side panels at the same time. Users can slide in the drawer with simple swiping.